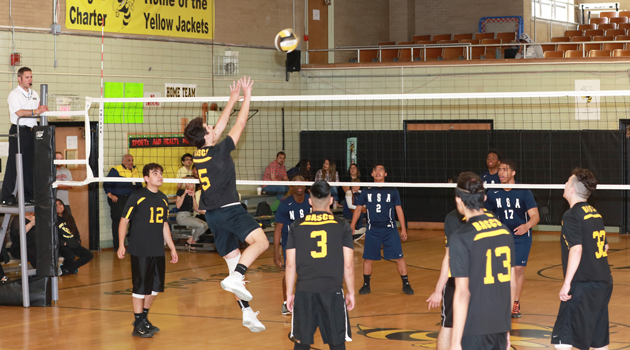 Yellow Jackets, David Amaya, Juan Bedoya, Daniel Ambrosio, Jonathan Castillo, and Gokay Demirel, who were playing in their last regular season home volleyball match on Tuesday, May 16th.2017. In just under an hour, with the support of a dozen or more other Yellow Jackets including myself, our home team beat North Star Academy 2:0!!! Way to go Jackets! This has been a long time coming and it’s great we can send out our seniors on such a high note.